It was really fun to get a chance to work with Full Moon Lagoon by Mo Beddell (thanks Andover!) I love the colors, the artwork, really everything about this collection. 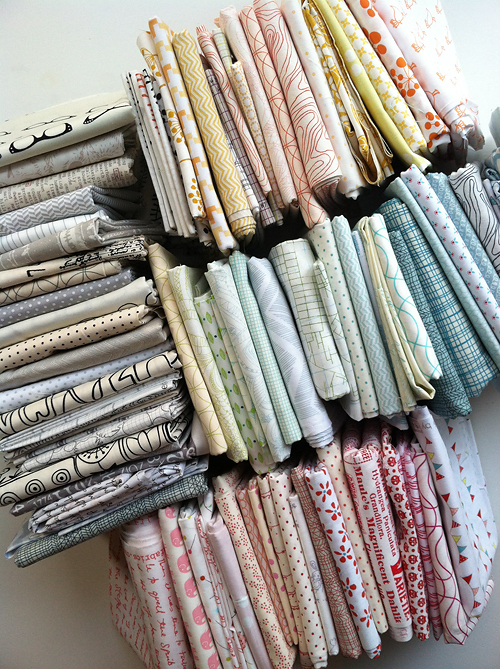 When I was brainstorming ideas for this fabric, I couldn't stop thinking about low volume. 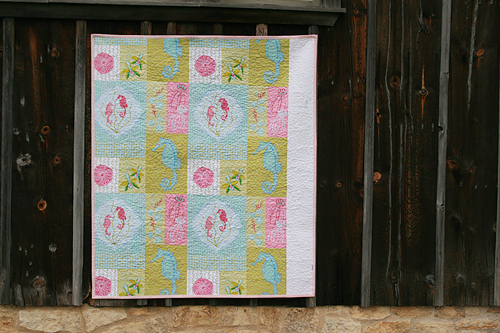 I really enjoyed making this little quilt a couple months ago. 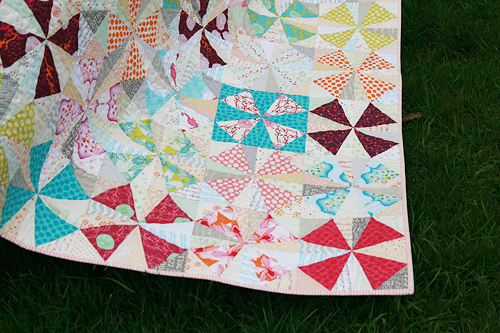 I started thinking about how great Ashley's low volume quilt, Marcelle Plus, looked, with the brights mixed in. 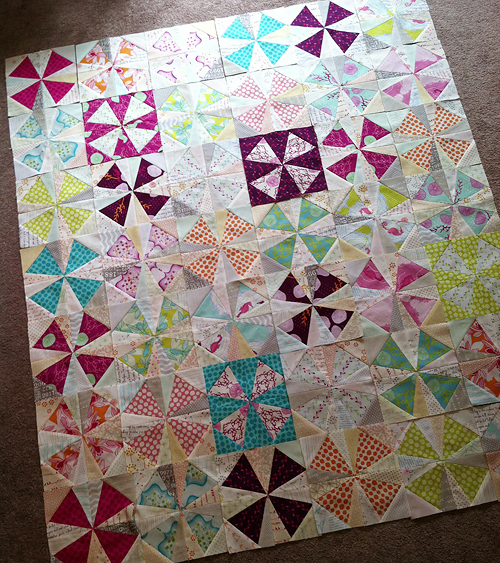 So I gathered my low volume fabrics to use as a scrappy background to a vintage block and started working. 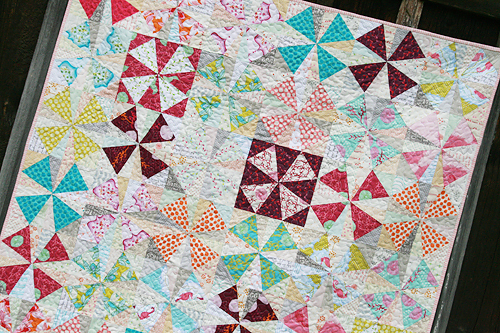 After doing a lot of straight line quilting recently, I decided I wanted to get back to a bit of meandering free motion quilting for a nice, crinkly look. It took a few minutes to find my "free motion groove" again, but I just love the results - even if it is a bit harder to photograph! My local quilt shop happened to have the great panel from the Full Moon Lagoon line, so I thought that would make a perfect backing. I was a little short - opps - so I added a simple strip of white down the side. The binding is a lovely, soft stripe from Cloud9 Simpatico. The finished quilt measures 48" x 56". 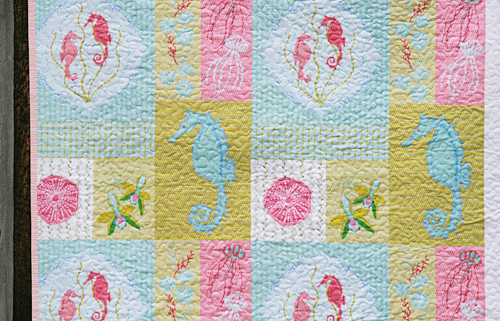 I know a lot of people have asked me about a pattern for this quilt, as I did paper piece my blocks. 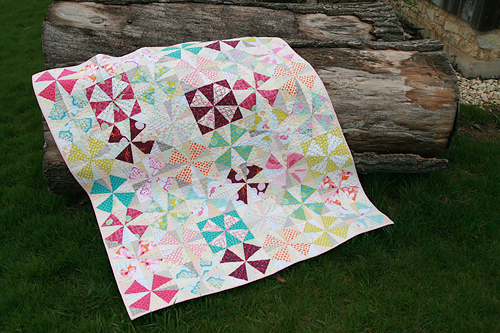 I created one and it's in my shop - it includes the required fabric amounts, a cutting table, some quilt math for figuring how many of each print to cut, and the paper piecing template. 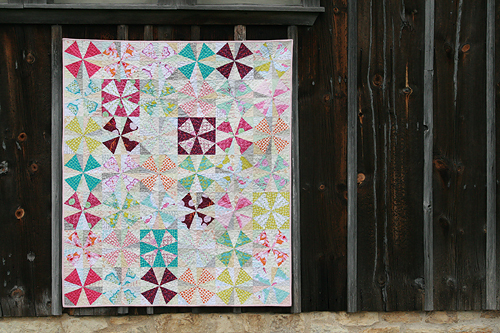 If you haven't paper pieced before, you can find a tutorial here on my blog. I really like to encourage everyone to learn. It opens up such a great world of opportunities for you!